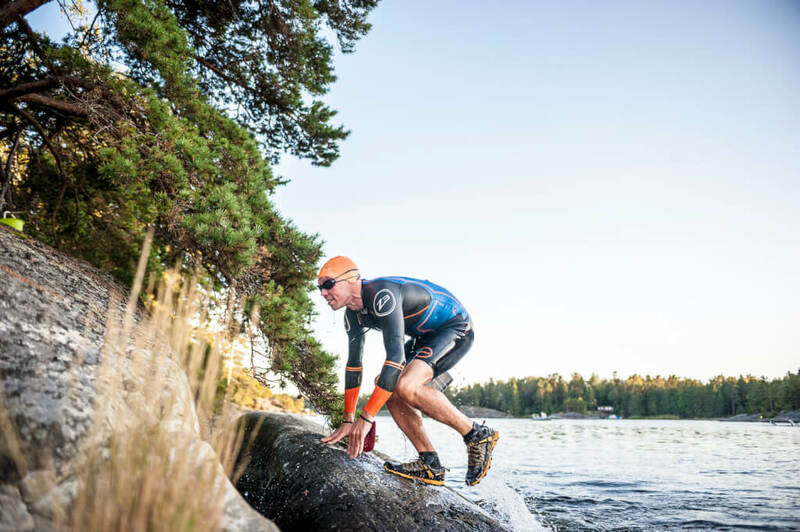 ÖTILLÖ (Swedish for “Island to island”) is a one-day swimrun race in the archipelago of Stockholm, Sweden. You compete in teams of two. The aim of the race is to get from Sandhamn to Utö, via 24 islands, by running across them and swimming between them. The total distance is 75 kilometres of which 10 km are open-water swimming and 65 km are trail-running. The first race was produced in 2006. The largest islands to run across are Runmarö, Nämdö and Ornö. In 2012 ÖTILLÖ was ranked as one of the toughest endurance challenges of the world by CNN.com. ÖTILLÖ is the first race and the origin to the growing movement of Swimrun. ÖTILLÖ is considered to be the World Championship of Swimrun even though it is not part of a federation. ÖTILLÖ is produced by Michael Lemmel & Mats Skott (pre-marriage Andersson), former World Class Adventure Racers.